It’s that time of year Hallmark fans. Yes, it’s Halloween, but that also means a brand new Good Witch Halloween movie and this year is no different. On Sunday, October 22nd at 8/7c, Cassie, Grace and the gang are back for a new adventure in Good Witch: Spellbound. If any of the previous Good Witch Halloween movies are any indication, the viewers are in for a fun and spooky good time. 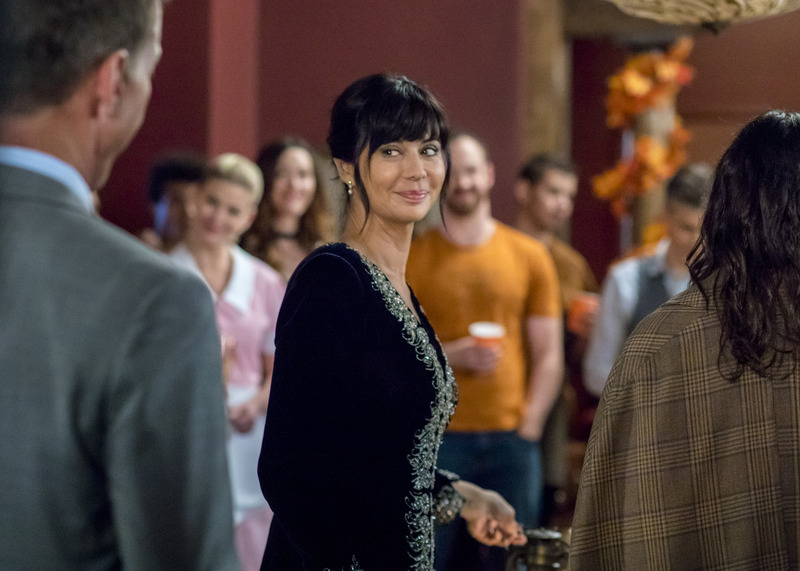 We sat down with series star Catherine Bell to talk about the latest movie, why she thinks people love Halloween so much and the time she dressed up as a famous musician for Halloween. 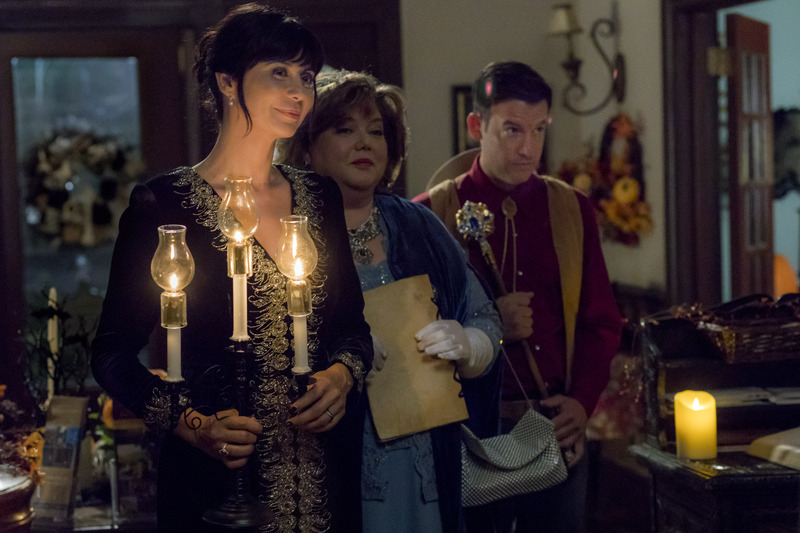 Pop Culture Principle – How does it feel to be back for another Good Witch Halloween special? Catherine Bell – It’s amazing! While we were filming, we realized that it was the ten year anniversary of when we all started doing Good Witch and almost everyone is still here. A bunch of the original cast, with a few new additions of course, are still here and many of the original crew are still here. It’s such a great group of people and we all feel so fortunate to still be here. Pop Culture Principle – Can you tell us the basic plot of Good Witch: Spellbound? Catherine Bell – There is a spell that has been cast by someone long ago who lived in Middleton and he may not have been able to be with the woman he loved. So, he cast a spell before he left town and cursed the town. Some clues and things that were supposed to happen start to happen in town and it becomes a bit unsettling for everyone and everyone in town is on guard. The Good Witch is definitely not scary, but this one is a little spooky, but it’s still safe for kids to watch, but it’s still our spookiest one. Pop Culture Principle – Many call Good Witch “feel-good” spooky. Would you agree with that? Catherine Bell – That’s exactly what it is. You are definitely not going to be jumping out of your seat scared, but you are going to want to know who this person is and who that person is. I can’t wait for people to see it! Pop Culture Principle – Actor Noam Jenkins plays the new stranger in town. How was it working with him on Good Witch: Spellbound? Catherine Bell – He was great. He had that perfect, mysterious, who is this guy that appears out of nowhere vibe. He happens to look like someone from the past. Trying to come up with clues together was a lot of fun. He’s a great actor. Pop Culture Principle – Why do you think Halloween is such a beloved holiday? Catherine Bell – My family loves Halloween as well. I work in Canada, but my family is in Los Angeles and one of my big requests before we start a season is that I have to be home with my kids for Halloween because it is such a big deal. I think one reason it’s such a big holiday is the candy for sure! I think it’s also the creativity of it. Coming up with a costume and being this completely different person or thing or whatever is a lot of fun. You get to put a little thought, effort, and creation into your costume which is a lot of fun. I like dressing up with my kids and sometimes we would do a theme, although they may be a bit too old for us to do themes now. It’s exciting to play dress up and who doesn’t love that! Pop Culture Principle – One year for Halloween you dressed up as the musician Prince. What was that like? Catherine Bell – LOL! Yes, I did! I am a huge Prince fan. I was in high school when Purple Rain came out and it was my senior year. I went to a thrift store and I found this purple satin jacket, I bought a white ruffle shirt and I curled my hair. I mean, I went all out and I won my school’s costume contest. I was a huge Prince fan and it was so much fun. Back then those little picture buttons were very popular and I had a bunch of Prince buttons covering my jacket. One of my best friends got me a custom-made license frame that said I get “delirious” over Prince. I was really into him back then! Pop Culture Principle – As an actor, how have you enjoyed the evolution of your character from the first Good Witch movie to today? Catherine Bell – You know what, it’s been really great having, watching and helping Cassie evolve and she certainly has evolved. The very first Good Witch movie we did, I had no idea that there would be another one. The movie had a really cool premise and she knew how to make people’s lives better and I loved that. I mean, I played someone in the military and I played an Army wife, but this role was something completely different and special. I think the themes of the movies were somewhat similar in the fact that some person would come into town and Cassie would have to figure out how to turn their lives around. Even if they were being “bad”, she always saw the good in people. She would insist on bringing out the best side of people or help people fall in love. When we started as a series, my big request was that Cassie can’t always be perfect. I thought that would get too predictable and very annoying. You would have someone that knows everything all the time and nothing really ruffles her feathers. So, we came up with a couple of things. We brought in James Denton as the new neighbor next door and of course, love and romance can throw a curve to even the best of witches because she doesn’t always know what he’s thinking. Then, you add in the teenage daughter, played by Bailee Madison, who is remarkable. I have a teenage daughter and I know that can throw a mom. It’s great because even though she mostly knows everything about everyone, sometimes those things throw her and she does her best to compensate that. Pop Culture Principle – One underlying theme from Good Witch is the ups and downs of single parenting. Can you talk about that and how you’ve approached that aspect of your character? Catherine Bell – Yes, that’s definitely a theme. I have the most amazing teenage daughter who is fourteen. She is just a sweetheart of a girl and yet, she’s becoming a young woman and there has been a lot of change and trying to figure that out and her navigating high school and all the stuff that comes with that. All these new feelings and friendships and boys and figuring it all out is a very challenging time for kids. You want to help them out and sometimes they don’t want to hear you. I’m in Toronto a lot, so I am parenting from afar as well and there are definitely some challenges there. I must say I relate to the scenes with Bailee and myself when we have those one on one mother/daughter moments. They are so easy for me to act because the words just come out of me and it’s very similar to stuff that I say to my daughter. The relationship I have with my own daughter, there is a lot of love, humor, and closeness. Pop Culture Principle – You’ve played Cassie for several Good Witch movies and three seasons. How protective of this character are you? Catherine Bell – Definitely! What is lovely is that the writers and producers respect my opinion so much, and it’s very rare and lovely on a television show to have that. Even though I’ve played a character for ten years, sometimes the producers and the networks are making those decisions. They actually defer to me a lot on the show. Would Cassie do that? Would Cassie say that? It’s rare because we are all on the same page and so in sync and it’s only been a few times where I spoke up and said something. I don’t have much to complain about at all. A line here and a line there maybe, but that’s it. I am so lucky and grateful. Pop Culture Principle – Any plans to jump behind the camera and direct an episode of Good Witch? Catherine Bell – You know, I never ever thought that I wanted to direct. I’m a producer on Good Witch and love doing that. I could see maybe at some point down the road directing. It’s a lot of work and there are many decisions that you have to make when directing. If I ever did it, it would be on a show like this where I know the show and characters really well. I need to do more research and maybe shadow some of my favorite directors and really feel like I know what I am doing. I’ve been fortunate enough to act as long as I have, but that doesn’t necessarily mean that you are automatically going to be a good director. Pop Culture Principle – How much do you enjoy interacting with fans on social media and do you enjoy live tweeting during episodes of Good Witch? Catherine Bell – It’s great. Bailee is a master at it and I’m striving to be good at Twitter like her. I always have enjoyed it and it’s really me on Instagram and Twitter, I don’t have anybody doing it for me and I never have. I like to try and reply to people when I can and say hello. I am so fortunate because I have the best fans. The three series that I have been on have been good quality shows where the characters are setting a good example and maybe there are some good lessons in there and my fans reflect that. I love my fans and I know many of them by name. That is what it’s all about, having a positive effect on your fans and I am so thankful and grateful for all of the fans throughout my career. Pop Culture Principle – Good Witch has been a consistent hit for the Hallmark Channel. Why do you think the movies and now the series remain a favorite with the fans? Catherine Bell - It’s really amazing that Good Witch crosses so many generations and affects so many people and it makes me feel so good. I think that’s the bottom line, Good Witch makes people feel good and unfortunately, there isn’t much in the world right now that is making people feel good, whether it be film, television or the news. It’s nice to have a show where you can put your slippers on, grab some popcorn, watch the show and feel good. Many people tell me they wish they could have Cassie as a friend. We would like to send a big thank you to the wonderfully talented Catherine Bell for taking time from her schedule to talk with us. Don't forget, Good Witch: Spellbound airs on Sunday, October 22nd at 8/7c on the Hallmark Channel. If you would like to keep up with all of Catherine's latest news and projects, you can follow her on her official Twitter account @reallycb or her official Instagram account @therealcatherinebell. . I love Catherine Bell and THe Good Witch.